If you felt some withdrawal pangs last January when a schedule conflict kept RCPM from their annual Jan Jam at JJ’s, you probably weren’t alone. In fact, it’s a good bet that Roger Clyne and his Peacemakers missed their annual opportunity to unwind in Rocky Point between tours last January as much as you did. Well, you can all rejoice because Roger Clyne and the Peacemakers will rock their January Jam this year, Friday, Saturday and Sunday, January 13-15 and they’re bringing a special guest band, Jared & The Mill, you’re gonna like as well. Jared & The Mill are six native Arizonans, born and raised in Phoenix, who have been touring almost constantly since 2011, playing their original country rock/folk rock blend of music in bars, theaters, music festivals and arenas, opening and appearing with the likes of Zac Brown Band, Barry Gibb, War on Drugs, Flogging Molly, Allen Stone and many others. They’ve taken advantage of the thousands of miles on the road together to write about and mold their music around the life experiences, good and bad, that have bonded these childhood friends into a family of close-knit recording and concert artists. This year’s January Jam is even more special because opening night at Banditos on Friday, January 13 will be Roger’s Birthday Bash with Jared & The Mill starting at 7PM and RCPM celebrating at 8PM with the set list picked by the birthday boy himself. This should make for a rockin’ jam! Saturday the 14th starts with the traditional Mexican Moonshine Tequila Golf Classic at the Links at Las Palomas with a shotgun start at 10AM. All proceeds from this tournament benefit several charities in Puerto Peñasco. Go to www.circusmexicus.net to register for this always fun event. 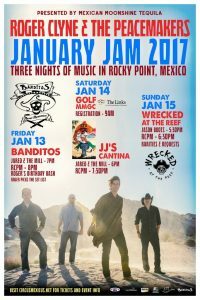 The “official” January Jam happens Saturday night at JJ’s Cantina in Cholla Bay, where the January Jam first started back in 2007. 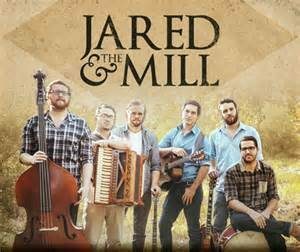 Jared & The Mill open at 6PM and RCPM take over at 7, jamming with Jared and the boys, and any number of musicians who might show up during the night. It’s always a knockout jam, a blowout party and tons of fun under the moonlight over JJ’s patio and stage! The Jam will still rock out on Sunday the 15th at Wrecked at the Reef, an RCPM favorite venue. The coolest of the cool dudes, creative song writer and musician, Jason Boots will kick things off at 5:30PM on the main stage at the Wrecked. Roger and the Peacemakers come on at 6:30 with their popular set of “Rarities and Requests” to wrap up this great weekend of January Jamming. You will want to get your All Inclusive 3 Show Commemorative Laminate in advance for $55.00 only available online. You can also purchase individual show tickets for $20 each show when purchased in advance online, or $25 beginning January 13 in Puerto Peñasco. All tickets and lanyards will be available at WILL CALL in Puerto Peñasco at Banditos. Get all this done now at www.circusmexicus.net. See you at January Jam 2017! This blog is brought to you by www.sonoranresorts.mx, Jim Ringquist, Director of Sales and Marketing.